England's Kyren Wilson. Pic: Getty Images. Ronnie O’Sullivan went on the attack in the Manbetx Welsh Open Snooker Championships – and was even too quick for the referee. The Rocket had an average shot time of 12.8 seconds during his 4-2 first round win against Sanderson Lam at the Motorpoint Arena in Cardiff. He completed a fourth game century break by potting the pink, expecting the referee to call 101. But O’Sullivan immediately played his next shot on the red before the pink had been returned to the table and the call was ’95’. That would have been his 992nd century break, but had to sit down knowing he had made a major error. Lam silenced. @ronnieo147 books his place in the last 64 of the @manbetxofficial Welsh Open with an average shot time of 12.8 seconds. The Englishman is a snooker genius at his best and underlined that by returning to the table and making a 116 break in the next frame with Lam only able to watch. O’Sullivan was careless to be point of recklessness, taking on risky shots in a performance which he played like an exhibition rather than a serious tournament. BBC commentators suggested his attitude was almost disrespectful to Lam and some spectators agreed, but O’Sullivan said: “Sanderson is a player and did well among the balls. “I wasn’t getting much early on and had to try and make something happen. All-out attack is sometimes the best form of defence. “I’m really happy at the moment, but if you are not playing well it can be difficult. “That’s often not a bad way to play. I am an attacking player and don’t want to be grinding out results. “I’m happy travelling about playing tournaments and enjoy playing the way I do. “If I am going to get beaten that my attitude is to go out attacking. That’s the best way for me. “I’m not that desperate to win. If I win I win, if not . . . . .
if i am going to get beat go out attacking. that’s the best way for me. World number three O’Sullivan is attempting to win a fifth Welsh Open title which would equal John Higgins’ record. Duane Jones, a 25-year-old from Mountain Ash who reached the German Masters semi-finals recently, won 4-3 against Xiao Guodong and said: “It was edgy all the way through and wasn’t pretty. “Certainly not free-flowing snooker. I tried to keep my concentration, but was missing a couple a d he missed a couple. 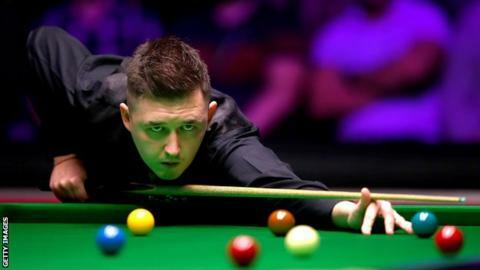 England’s Kyren Wilson, ranked seven in the World, won 4-0 against Andy Lee, scoring breaks of 63, 88, 67 and 60. The match was played on the TV table and that put extra pressure on Lee, who isn’t used to playing in front of the cameras. “It’s a different kind of pressure on the TV table to outside tables,” said Wilson, who was the German Masters winner. “It can be a daunting experience when you are not used to it and I felt a bit sorry for Andy at times. 💬 "I feel very comfortable in those situations"
“Top players take advantage of that and it happened to me in the past when I struggled without the experience. Wilson talked about his own targets for the Welsh Open, saying: “I want to enjoy the experience. I feel I’ve been chasing titles for too long and not always enjoying it.